On Tuesday, September 12, the Apple company released a new line of iPhones, Apple watches, and Apple TVs. This new line includes new features and updates on past products, to make them better. For example, the iPhone 7 has touch ID, where as the new iPhone X/10 has face ID to unlock the phone. The X has many new features, including moving emojis, and an all around screen. To some this may be intriguing, but to some it seems like a lot of things that could go wrong. As impressive and amazing this may seem, there are some downsides to the iPhone X. First off, it comes out almost two months after the iPhone 8 does, so if you want it you'll have to wait. Secondly, the phone costs over $1000! It is about $1000 for the 64gb, and the 256gb will cost $1,149. So, if your willing to spend the money and most likely wait until next year to get your fancy new phone, then go for it. Also, new product normally come with new sets of bugs and problems that can occur, so there's always a risk. If you have an iPhone 7, it is probably not worth getting a new phone. This is because there is very little difference in the 8 and the 7. The two biggest differences are probably the wireless charging, and the glass back that the iPhone 8 has. Then of course, there is the new and improved camera, but that is mostly the same. The iPhone 8 also come in only three colors: silver, light gold, and space grey. But unlike the iPhone X, the 8 has two sizes, the plus and the regular. The iPhone 8 is a good phone for someone who wants or needs a new phone, and who doesn't want a new, really fancy phone. For those who like the concepts around the X, there will surely be people out there who would love your feedback on it. If your not a person who loves phones, then there is also the option of getting an Apple Watch. The Apple Watch series 3 came out along with the new phones, and it's pretty cool. It now has cellular connection, so it no longer needs a phone to accompany it wherever it goes. It is also waterproof, so you can go to the beach or in the pool with it. The Apple Watch will certainly be an interesting purchase. Therefore, no matter what new device you may want, there will always be countless amounts of choices to choose from. Women in the NFL: Breaking through the glass ceiling. She was right, because other women do work for the NFL like Stephanie Jackson, the Vikings scouting intern. Stephanie is on her second year of law school and has worked on multiple things to do with the NFL such as working on player contracts, the legal team, etc. Another woman who works for the NFL is Charlotte Anderson. Anderson works for the Cowboys, she is listed as executive vice president, vp of brand management, president of charity foundation, and is said to have her say in anything happening from the super bowl to decision making at Cowboy stadium. I was shocked and inspired when I found out that lot of women work in a mostly male dominated work force, and I hope that when I get older there are even more women who work for the NFL! Typoglycemia: Cna yuo raed tihs? In case you couldn't read that it says: According to a research at Cambridge University, it doesn't matter what order the letters in a word are, the only important thing is that the first and last letter be at the right place. The rest can be a total mess and you can still read it without problem. This is because the human mind does not read every letter by itself, but the word as a whole. To prove this, I had about 12 students at AMS read the statement. They ended up all being able to read it. However it won’t always work. For example, if you had a word like photograph, where the ph makes the f sound, it would be harder to read: pohoatgprh. That wasn’t as easy to read as the word hppay, was it? The Greek God of the Sea, Poseidon. First it was Hurricane Harvey, then it was Irma, after that comes Jose, and last but not least, Katia. What’s next? Why are there so many storms targeting the U.S. and other areas? How about a little background, if you don’t already know. On September 2, 2017, Hurricane Harvey, a category 4 storm, struck southeast Texas leaving a destructive path behind it. Not long after that was Irma. Irma struck the Caribbean Islands and the coast of Florida. It also had an after effect in South Carolina, Georgia, and in our town of Asheville, NC. Though by the time it reached us it was only a strong storm. It killed about 45 people throughout its path of destruction. So what do you think is the causes of all these hurricanes? These days, we know there is a science behind the cyclones. When warm moist air over the water rises, it is replaced by cooler air. The cooler air will then warm and start to rise. This cycle causes huge storm clouds to form, which can turn into a hurricane. However, back in ancient times, so many cultures had their own unique ways of justifying a hurricane. For instance, the Greeks. Poseidon, the God of the Sea. A bad-tempered, moody, greedy, easily vengeful olympian Greek god. He wielded great power with a special Trident. This Trident could produce Earthquakes, or humongous waves, with a simple sweep of the implausible staff. But with him being ill-tempered by nature, this became a massive concern. Possessing so much great power, and having such a short fuse lead to many dangerous crisis. Poseidon has been know for making careless mistakes resulting in catastrophic destruction. So the Greeks believed there was a higher god (Poseidon) punishing them, or simply throwing a fit of rage. Another culture has their own interesting way of rationalizing it. The Africans. Back in the 1619, African tribe members were wrongfully taken from their homes and families, and enslaved on a boat that would take them to a different countries about 6,000 miles away. They were forced to work for privileged rich white men under surveillance as maids or butlers, farmers, blacksmiths, or picking cotton. If they messed up in the slightest way, they were vulgarly punished. It is said the Mother Africa oversaw these wrong doings and, in turn, she created these powerful gust of wind, rain, thunder, and lighting to punish those cruel people who had hurt hers. So, could it be Poseidon's anger. Or Mother Africa’s revenge? Maybe not, but really. Who knows? One very popular challenge is the NUCLEAR FIRE NOODLE CHALLENGE . This challenge is that you eat all the fire ramen without water or milk. People do this on youtube channels to entertain there subscribers . Most people can’t do it because it is really HOT! Some people get through it and actually enjoy it . I think I could do it because I enjoy hot stuff . Another popular challenge is the BUFFLO WILD WINGS BLAZIN WINGS CHALLENGE. The challenge is that you eat 12 wings in 6 minutes, without water . The BLAZIN sauce is at 300,000 scoville units (which is REALLY hot). Most people don’t finish this challenge because it is so hot that it is painful. Portable and quick foods are a big thing in our daily lives . Here are a few street foods that are quick and mess-less . Another popular street food is FALAFEL. Falafel is a deep fried ball made with chickpeas, fava beans, or both . You can find falafel at the mall, the place is called THE DONER. As of Thursday, the seventh of September, the newest movie adaptation of the Stephen King novel “IT” has been released. There is also the 1990 mini-series of the Stephen King novel. I have decided that I should compare the two film adaptations. To compare these two clowns has not been difficult - Tim Curry's 1990 portrayal of Pennywise, The Dancing Clown, was far superior and much more substantial (with Tim Curry really getting into the roll). All the while Bill Skarsgard, though he is a great actor, was almost was just a plain monster that the kids had to defeat. Another difference in the films were the kids and their fears. One obvious thing is that the kids seemed to be better actors in this most recent adaptation, and they are a little more faithful to Stephen King's novel. Another difference from the 1990s too the 2017 adaptation is that they refer to themselves as the lucky seven in the Tim curry version, while there are only six of them in the latest adaptation. These two films both have their highs and lows respectively. But, all in all, I would reason that the 2017 adaptation is far superior to the former, as Tim Curry was almost the singular redeeming thing about the mini-series. However, with the upcoming sequel, the children all grown up and that could change! The genre of K-Pop has made its way to America and is continuing to thrive. K-Pop is an abbreviation of Korean Pop, a music genre that consists of electronic, hip hop, pop, rock, and R&B influences that originates in South Korea. Currently a certain boy group has been dominating the K-Pop industry; they are known by their Korean name ‘Bangtan Sonyeondan’ but more commonly the abbreviation, BTS. The group has many other names including: Bangtan Boys, Bulletproof Boy Scouts, and most recently Beyond the Scene. The group debuted in June of 2013 with the song “No More Dream”, and have released several albums since then. Their most recent project is their upcoming album; ‘Love Yourself: Her’. The upcoming album is due to be released at 5:00 AM EST on September 18th. The members (Kim Namjoon, Kim Seokjin, Min Yoongi, Jung Hoseok, Kim Taehyung, Park Jimin, and Jeon Jeongguk) have released many pieces related to the album to get the fans excited. So far they have released three highlight reels with posters to go along, four sets of concept photos, the official track list and two music video teasers for a song titled “DNA”. On September 4th a comeback trailer was released on the groups’ official YouTube channel. The trailer included a brand new song titled “Serendipity”, sung by member Park Jimin. The attempts to excite fans for the release seem to have worked wonders. Expectations are high as the album is the best selling K-Pop album of all time on the Billboard 200 list. The album has already sold upward of 1,000,000 copies solely on pre orders. The first thing that was released relating to this album was the series of highlight reels that all went together to create one cohesive story. The highlight reels gave viewers the first look at the concept of the album and the overall vibe that it would have. After seeing the videos, many people theorized that the concept was about a girl specifically. 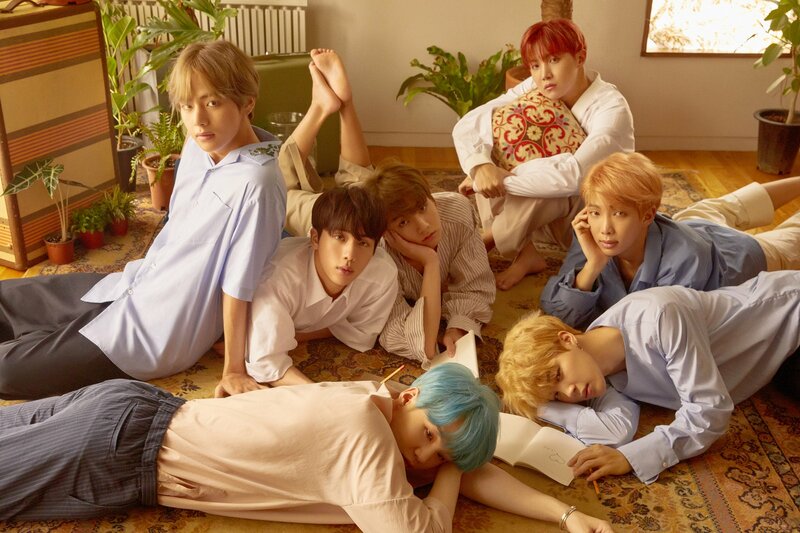 A few days later the group clarified the actual theme of falling in love and being able to love yourself in the process hence the name of the album. However this album also touches on many other themes such as loss and death and the uglier side to love. This thematic four part series is actually a continuation of their earlier concepts. The group has been releasing videos that are similarly themed to “Love Yourself” since 2015 with the release of the song “I Need U” which kicked off “The Most Beautiful Moment In Life” series. The final piece of information that many fans, also know as ARMY, are talking about, is the fact that the group is collaborating with American stars, “The Chainsmokers”, for a song on this album. It has been confirmed that Andrew Taggart of The Chainsmokers is a co-writer of the song “Best Of Me” which is featured on the official track list. The album will no doubt be revolutionary for the success of the group and it seems inevitable that the group will receive more awards and break more records than ever before.